"Das Aussenkommando Landshut des Konzentrationslagers Dachau"
This will be a shortened but not a short report - with a number of examples. It was not easy for me to get a full picture of this "Aussenkommando Landshut". you find information about prisoners from KZ Sachsenhausen-Oranienburg,too. So I asked the author, Prof. Dr.Georg Spitzlberger, how to understand his description. - A 14 years old boy. 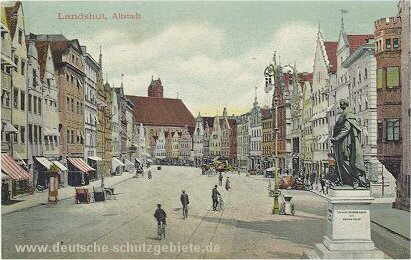 which was in Landshut from September 1944 to the end of April 1945. (Spitzlberger, see title, page 151/152). The boy was 14 years old when he met four or six thin prisoners in the street. What would the guard do? Would he shoot?...But nothing happened. ....But what would this guard have done..."
from Berlin to Landshut. They settled where was the former "Kleiner Exerzierplatz"
Some time later in winter 1945 a separate Jewish camp was built, too. About 500 Jewish people had to live in corrugated iron baracks..
.....there was an SS- Guard barrack, too. "This was the so called "Aussenkommando Landshut/ Bayern" - first mentioned in Sept.1944. they were transported to Muehldorf am Inn.."
in Oct.44 this Kdo. was reinforced and split into two details: Baubrigade 2a - Baubrigade 2b. over the Weinberg towards direction South into an unknown direction." with the Jewish people. How far they came up to the American invasion is not known. from Landsberg am Lech, 500 men, all of them Jews, 60 SS men accompanied them." KL- prisoners from Berlin-Oranienburg who were brought daily from Furth by train." has not become public. A majority spoke German. But there were foreigners, too. William W. Wermuth came to the NL(sub camp) Landshut in January 1945. He had taken Henschel to court from Hartfort USA, on 7 May 1968. Former Prisoners of Camp Landshut who are listed as Witnesses in the "Henschel- records"
in whose the coldness entered directly. Heaters were there, but it was not allowed to use them. did not get meat, at least sometimes stinking horses meat on which they got a bad stomach. two camp doctors, prisoners themselves, had neither material nor medicine...."
"In these few months many persons died of diseases and exhaustion. cemetery where they were buried in mass-graves." the proceedings were abandoned because the defendand could not be identified anymore. Here up to May 1945 83 Jews died due to the inhuman imprisonment. And buried in the KZ- Honor - Cemetery Flossenbuerg. in Deutschland und deutsch besetzten Gebieten(1933-1945), Arolson, Februar 1969. - Koenig, Maria, muendliche Berichte vom 8.5.1989 und 23.4.1990.
der Bundeszentrale fuer politische Bildung, Bd. 245, Bonn 1987. - Trautmann, Heinz: LZ Juli 1990, Seite 42.